Heritage Book | Portraits of M.E. While growing up, I had a mother who loved to read. In our house there were bookcases lining our walls with books piled high on each shelf. It was because of her, I grew up reading and having a passion for books. When she passed away, a lot of her books were packed away…and I’m not even sure where most of them ended up. I know I have two or three of them (mostly Star Trek books – we both were fans of the show), my sisters have a few, and my Dad has some of them too. So when I received a wedding gift from my cousin Harold and from my Aunt Emily, I was very surprised to open it and discover an old black Bible. This is what makes this Bible extra special – the handwritten note my Mom wrote when she received the Bible. I turned to the first page and saw that it was first given to my mother back in 1957 as a birthday present from her mother. 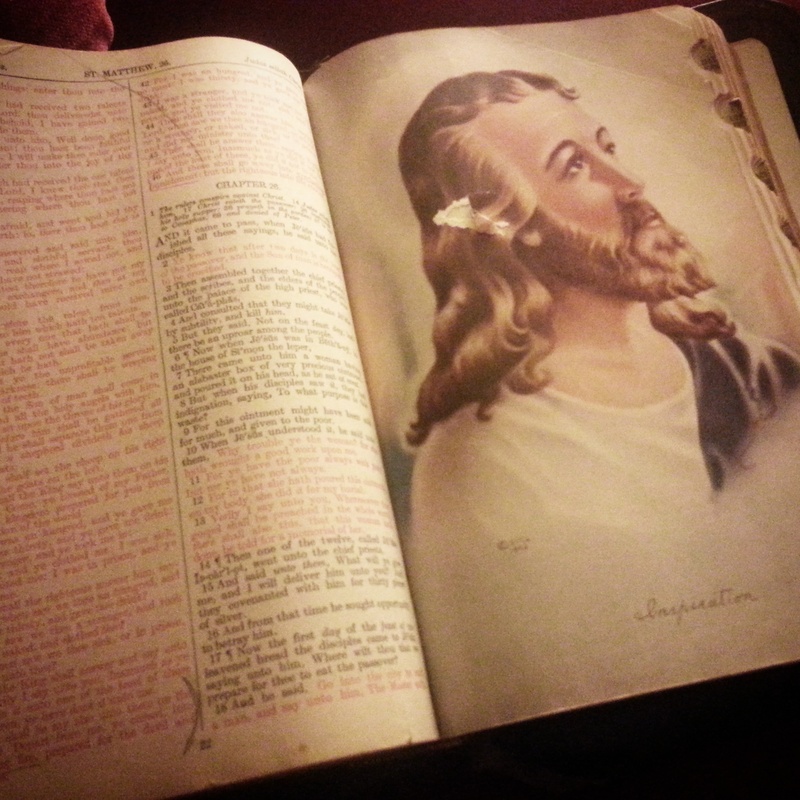 I looked up at my husband and said, “it was my Mom’s Bible”, and we looked at each other in astonishment. 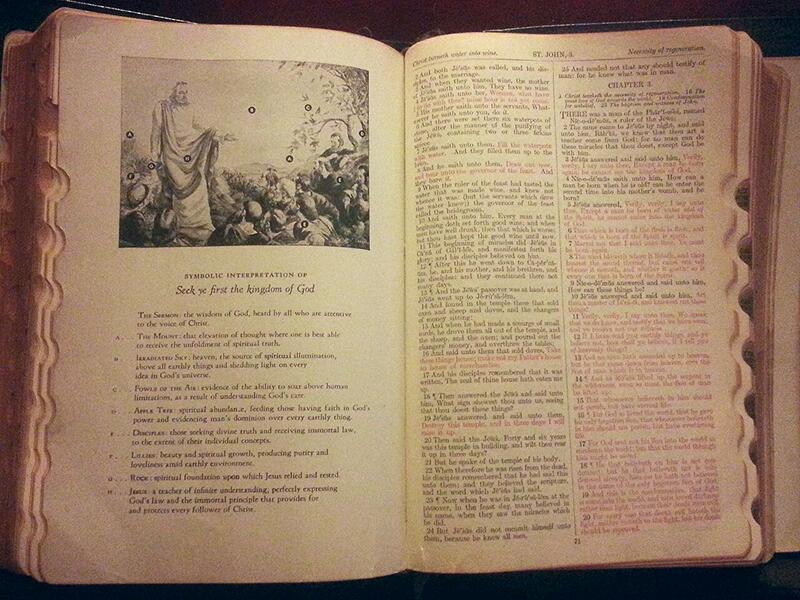 I didn’t even know this Bible existed, yet as I held it in my hands, I felt an overwhelming emotional response in me. My family knows I’m not one to display emotion, but holding that weathered book, I began to cry. Looking over at my husband, I could see he was touched by the gesture too. 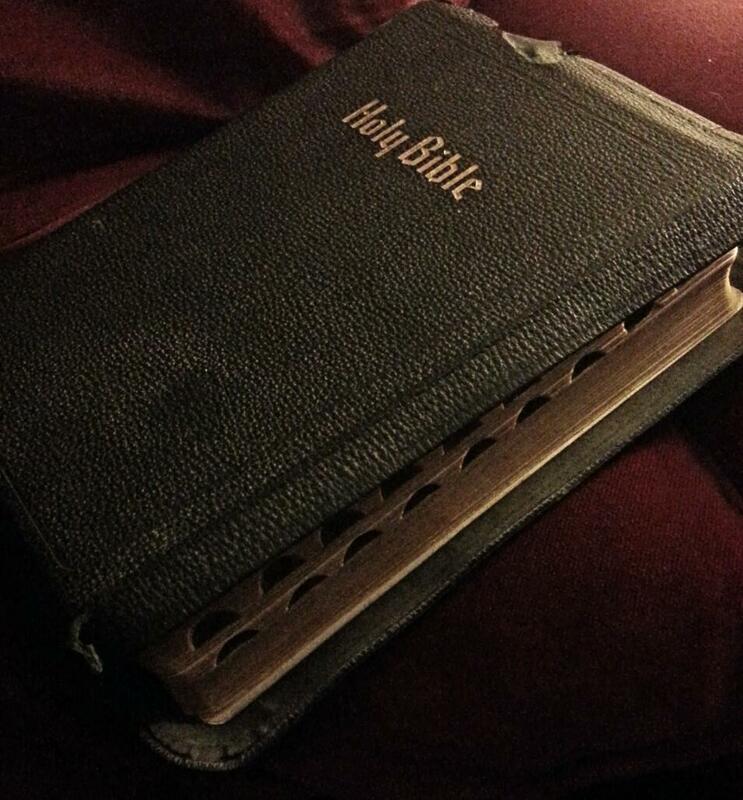 The Bible is more than a book, it’s a piece of my Mother’s history. It’s been passed down to me and I will cherish it for as long as I live. I have a lot of Bibles in my home. Hardback, softback, large print…then there’s the translations. There are so many different types of Bibles out there and I think I’ve become obsessed with owning all the different kinds. However, this Bible is sure to hold a special place in my home and my heart. Let me share with you some of the features this Bible contains. The aged Bible that was given to me as a wedding gift. 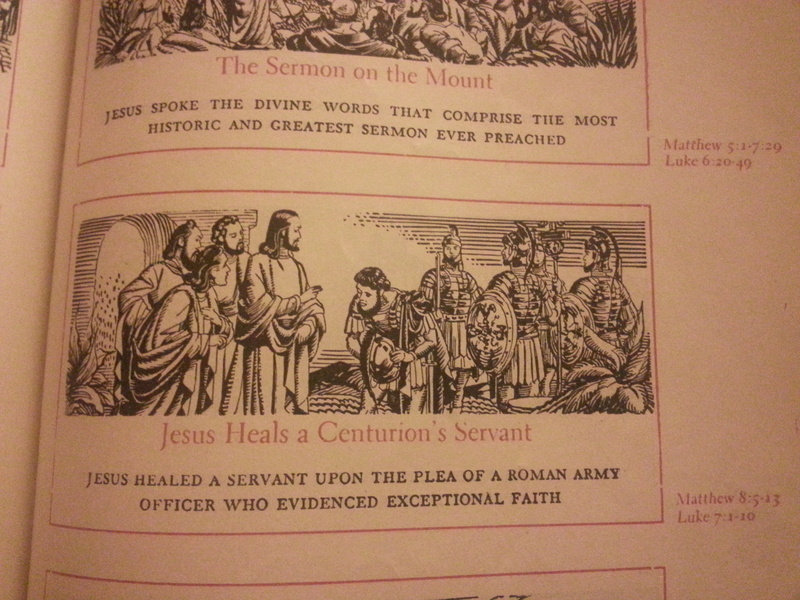 The life of Jesus is shared in picture form with scripture referenced on the side. A beautiful picture drawn by Albert H. Winkler. Symbolic interpretation of Seek ye first the kingdom of God. 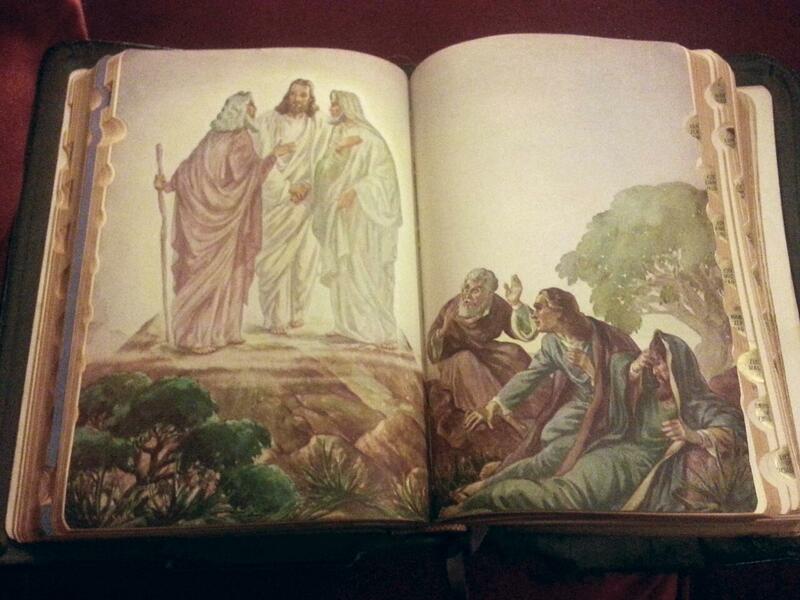 Beautiful illustrations of the Bible stories. There are 6 full colored pictures inside. A concordance full of words and names of those who are mentioned in the Bible. 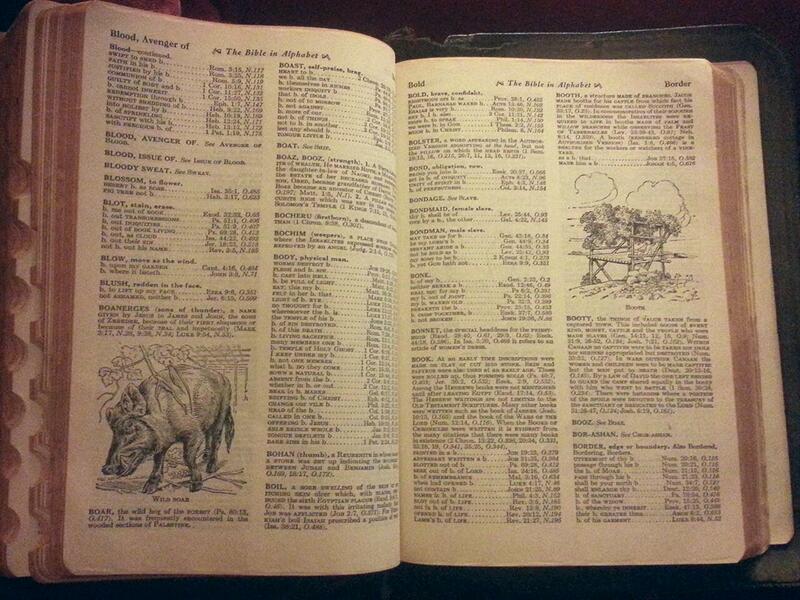 It’s really extensive and is over 100 pages of information. Wow, I didn’t know mom had that Bible either. I can’t wait to see it in real life. What a treasure! Beautiful book and it sounds like your mom was a beautiful person.